We arrived home safe and sound two weeks ago. We both went straight back to work - it's a bit of an adjustment from our trip, but we're both happy to be back! Now that we have a real computers and access to all of our pictures (all 13751 of them! ), posting to the blog should be a lot easier. We're going to continue on posting from where we left off and we'll probably post additional pictures for some of the previous blog posts. One thing we're going to be doing differently from now on: we'll include just one picture in each post along with a link to our album on Google+. Google+ makes looking through the pictures a lot nicer, and allows us to upload more pictures. If you have trouble seeing the albums, please let us know. After an early morning departure from Bologna, we arrived in Casablanca and headed directly to Marrakech by train. In Marrakech we met up with my cousin Sabine (featured in our Lausanne post). Sabine's fiancé, Redouan, is Moroccan and she's visited a few times before. Sabine did all of the planning for the Morocco section of our trip and they both helped us learn about local food and culture. We were really happy to have them with us. We spent most of our time in Marrakesh in Jemaa el-Fnaa, the main square of the Medina (old city) and in the Souk (market). The Souk is unlike anything I've ever seen before. It's a huge (the largest traditional Berber market in Morocco), but there's no obvious order to how things are laid out. It's full of twisting alleyways and dead ends. It didn't take very long to get lost (although after enough wandering around we were able to find our way out). The merchants in the souk were selling all sorts of stuff: herbs, spices, fruit and vegetables, leather bags and babouches (a moroccan style slipper), scarves, carpets, ironware and lanterns, clothes. 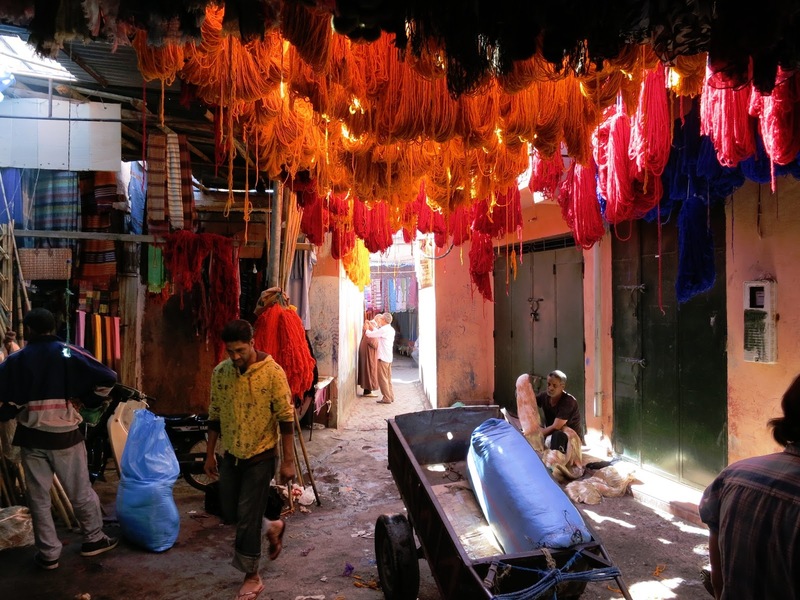 Along with the merchants, we also saw many leatherworkers making bags and pouffes, wood workers, and the wool dyers (which you'll see in the pictures). We ended up buying a pretty cool looking wooden chess set. It's made in a neat way so that twisting the top of the board reveals the pieces stored beneath it.